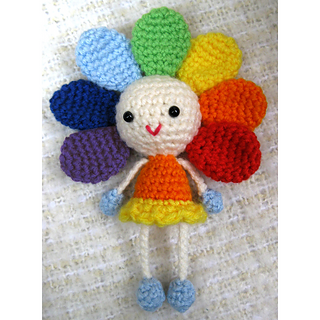 This is a crochet pattern for a little sunflower doll in the colors of the rainbow. You will love this little fun project which is also a great way to make use of your yarn leftovers. 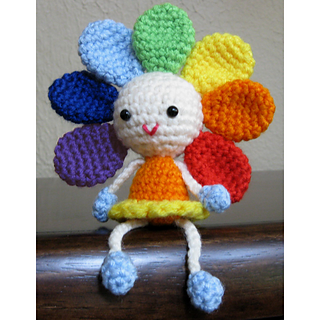 You can also use this pattern to crochet a sunflower or a cute red or pink flower doll - there is plenty room for your imagination! Includes one PDF file, 9 pages. 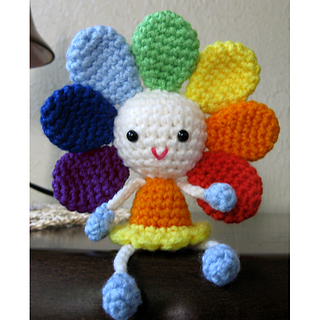 The pattern is written in English, using US crochet terminology for right-handed crocheters. It contains detailed instructions and many step-by-step photos and useful tips. worsted weight yarn (199g = 355yd/325m) and a E/3,5 mm crochet hook. Easy - you will just need to know how to crochet single and double crochets, starting with a magic circle, and increase and decrease techniques. I put a lot of patience into my patterns, but human mistakes are always possible. 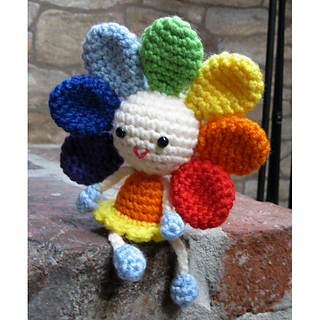 Please contact me at crochetcutedolls@gmail.com if you have any questions.